Are you looking for something similar to Caribbean Stud Poker, but also using a little piece of Video Poker? 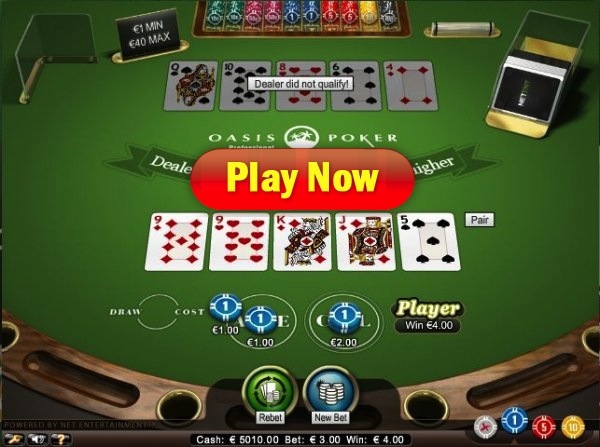 Oasis Poker from Net Entertainment is exactly that – it merges these two popular casino poker games and turns it into an exciting & unseen casino poker game. So how does Oasis differ from the two, more popular games that are similar to it? Well, if comparing to video poker – only thing that is somewhat similar to it, is the chance to trade your cards. Up to all 5 cards can be exchanged in any particular hand. How does this affect the gameplay? Well for one, it’s way more exciting to play as there’s more room for making big, highly valued and paid hand combinations. However, unlike Video Poker Machines, this is a casino card game and played against the ”house”, which is a term often used when refering to casinos. The game isn’t really much different or harder to play than Caribbean Stud or any other casino poker games alike. Before starting with getting an actual hand dealt, lets take a quick peak into the types of wagers that can be made. ”Ante” – as with all casino card games, especially poker related ones, the ante is a required wager without whom the game can’t be played and no cards are dealt. This very aspect is also true for Oasis Poker. Before making the ”ante” note that this will also be the cost of replacing any cards, should you want to do so. ”Call” – this is the final action in the game and one that leads to the showdown. Note that if you decide to call, you’ll have to put up 2x the ante bet. ”Fold” – if your hand is not good enough or you don’t think that you hold a chance of winning against the dealer, feel free to fold. This is pretty much surrendering and giving up your ”ante” bet, while not risking any other, extra wagers. Before we get into anything other, I’ll add that the hands are valued same way as in a normal poker game. All five cards are used to create the best possible combination. There’s a payout table in Oasis that is used to determine the odds of your payout. Note that any odds are applied only to ”call” wagers and ”ante” is always paid at even money odds, when you’ve won. Also, there’s a VERY significant rule for determining whether a payout is going to be awarded – dealers qualification. I’m not referring to how well he performs at his job, but rather saying that his hand has to reach a certain level of strength in order for any payouts using the paytable to be awarded. In Oasis Poker, the dealer’s hand is considered as a qualifying one if it’s at least AK or better. All pairs are qualifying hands, but anything that loses to AK is not. Here’s the payout chart and as you can see, the payouts are rather lucrative, with up to 100 times your ”call bet” win being offered. There also are a couple of basic tips that I would like to advise to use, when playing Oasis Poker online. Firstly, you should never switch more than one card, ever. There are no exceptions to this rule and it’s simply something that should never be done. Other than that, you should also never switch with two pair or better. Yes, the payout for full house is higher, but you’ll make it only a tiny % of time, while giving up so much money. You are all set for enjoying a great playing experience, but there’s one problem – you might not have a casino site to do so at. Oasis Poker is available at all NetEnt powered casino and one of the best ones using this software is Guts Casino. You’ll have access to MicroGaming and Net Entertainment games for a chance at millions in progressive jackpot prizes and of chance to play this game for real money! CLICK HERE to Join Guts Get 100 Free Spins Now!